If you prefer to enjoy the surf using a boogie board or body board, we offer a wide range of premium rental options for the whole family to enjoy the waves in Playa Grande and surrounding areas. 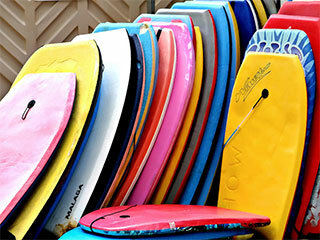 We carry a large selection of bodyboards for rent. Waveskater bodyboards are a fun new design, with channels underneath to increase speed, and a concave deck for a more streamlined profile. 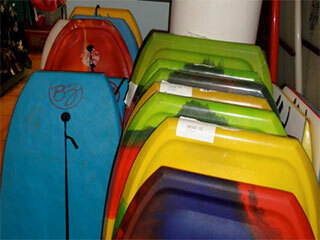 We have small kids sized boogie boards, and everything in between up to large adults sized boogie boards. 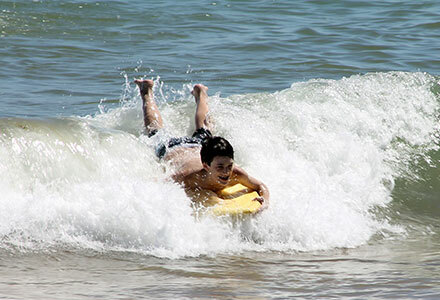 When selecting the correct size, look for a body board that comes up to your belly-button. Bigger is fine, but too small and it will make it difficult to catch waves. Please ensure boogie boards are not left top-side up in the sun. Turn the board over so that the slick hard bottom is facing up when not in use and in the sun. Thank you. Pura Vida! In between our morning SCUBA dives, we decided to spend the afternoon surfing over at playa grande. We had heard about Frijoles Locos and stopped in ...where we grabbed six boards of various sizes and two boogie boards for our 12 person all age group. 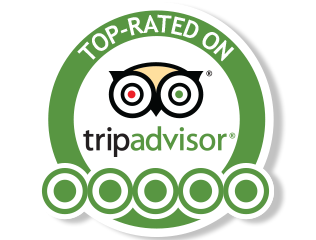 Super helpful, friendly and accommodating for our big group with no advance notice. Thanks to the great team at Frijoles Locos!! We will be back for a longer stay next time.